Yesterday, around this time, I made a loaf of pumpkin chocolate chip bread. Today, we have maybe a slice and a half left. It is that good. You can't go wrong with pumpkin and chocolate together. The added bonus is that, other than the canned pumpkin, you probably have the rest of the ingredients at home. 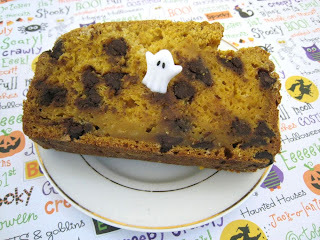 I altered my very favorite banana bread recipe to work with pumpkin, since pumpkin puree and mashed bananas basically have the same consistency. And you really can't go wrong with adding chocolate chips to anything. Beat butter & sugar together, add eggs. Add pumpkin, yogurt, vanilla, blend well. Add dry ingredients, blend until moist. Bake in a loaf pan at 350 for approximately 50 minutes-1 hour. ha! I did the same thing with your banana bread recipie last month! It was delicious! I made 2 loaves of this (or, well, the recipe from the little Fall Baking magazine--it's similar, but no yogurt) for the Pumpkin Party this weekend--it's fabulous!